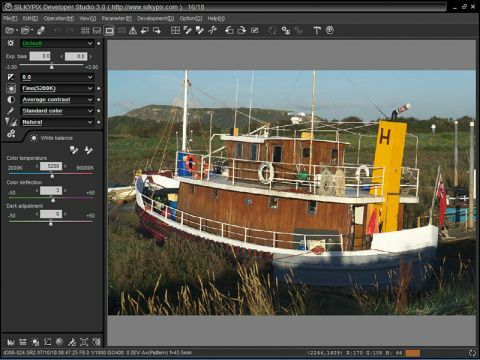 SilkyPix Developer Studio is shipped free with the Panasonic L10 digital SLR but is also available as a standalone program. At $149, it's quite expensive so what makes it so special? Certainly there's no shortage of features. It seems able to recover extra highlight detail (via exposure adjustments) and it can correct chromatic aberration and fix distortion. It's also up to date, supporting a large number of digital SLRs and the newest models, including the Sony A200, Nikon D60 and Pentax K200D. There appears to be no option for adjusting highlights and shadows separately but, apart from that, SilkyPix does pretty much everything you can do in Photoshop. But there's a downside. SilkyPix uses some odd jargon, including 'tastes' for preset tone/colour adjustments and 'cloakrooms' as a kind of clipboard for development settings. The online manual is hard to wade through, since it's clearly written by someone with flaky English. It's going to require some patience and determination. The tool layout might be efficient once you work it out, but it's takes a little time to figure things out. That's unfortunate, because SilkyPix does produce some very nice-looking results. It did a good job of suppressing noise while retaining detail in an ISO 1600 EOS 1Ds MkIII test image, and the chromatic aberration tool works well, offering a simple eyedropper as an alternative to the two aberration sliders. SilkyPix shows a lot of promise, but it's too expensive as a standalone application, and the interface and the manual need overhauling.